Hey you! Yes, you! Yes, the ridiculously attractive person reading this. Your clothing-article-of-choice really highlights your eyes. 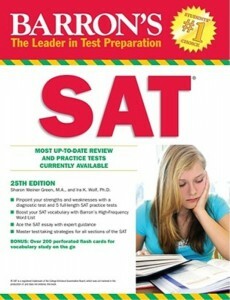 And I’m almost positive that you’re looking for some information on the top SAT books. 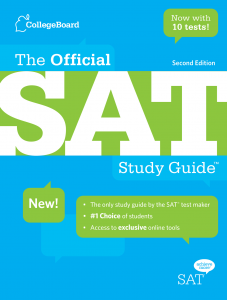 How many of you wake up every morning and catapult out of bed, itching to get your hands on one of those SAT books you purchased? Is your day made when you can read about these fascinating math strategies? How many of you get together with your friends on the weekends to play vocab games with words you’ve never heard, and will probably never use again? See, here’s the thing. SAT books might not be the most exciting reads ever. And heaven knows they’re not going to spawn a Hunger Games-esque movie saga anytime soon. But inside these books are valuable information. And if you want thousands of dollars in scholarships (merit-based and private), and if you want to get into the college of your dreams…well, lucky you! These books can definitely help you reach your goals. Here’s a list of the 7 top SAT books which I have personally read in full and analyzed–and which ones can best help you out in particular areas. Onward! Obviously, Kaplan is a huge test prep company, so anything with the Kaplan name will make you look up and listen. But this particular prep book is actually very complete, accurate, and well-written, with a big emphasis on the math strategies. It also has practice tests and practice problems, and could be easier to understand than a few of the other big-name prep books. 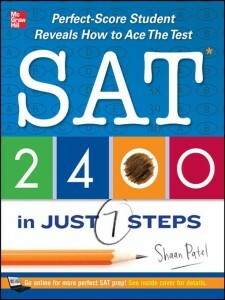 Dreaming of a 2400 on the SAT? Well, this book was written by your idol, then. Shaan Patel actually scored a 1770 the first time he took the test, updated his strategies, scored a 2400, and went on to found a test prep company. Seriously? Main pros of this particular book? He highlights his strategies in an incredibly relatable way. His tone isn’t stiff at all, and it’s easy to understand and absorb. Also–even though this doesn’t have anything to do with what’s actually in the book–it’s remarkably light, which is great news if you’re planning on lugging it to school in your backpack for some studying between classes! This is the Princeton Review’s contribution to the SAT literature world, and after Kaplan’s and Shaan Patel’s, it’s definitely the third-best pick. Even though it does a great, clear job at explaining the reasoning behind answers on the practice problems, and it’s super-easy to carry, it doesn’t do very well at actually fleshing out the strategies. If you’re looking for a detailed explanation of the strategies, instead of a quick brush by them, read one of the first two books on the list. Great review sections are the name of the game with Gruber’s. It evaluates the reasons why students miss certain questions, gives full explanations, and has five full-length practice tests. 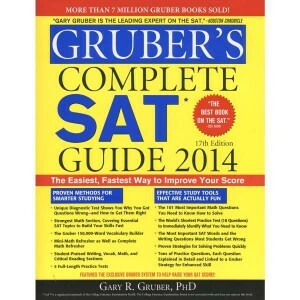 Use Gruber’s to study math and writing especially–it has an excellent grammar section. However, its reading strategies leave something to be desired. Wait, this one is from Collegeboard! The company that gives out the SAT. Surely they should be the best! Not near the bottom! This book has a ton of practice tests. Official practice tests. But that’s about all it’s good for. It doesn’t teach any strategy–it just gives you basic study tips and hopes you’ll figure it out. If you’re looking for strategy help, make sure you get one of the other books–and then return to this one for a high-quality practice test! If you want vocab, Barron’s is the book for you! It has all the vocab you could possibly want, and so much more. In my opinion, Kaplan, Princeton Review, and SAT 2400 do a better job of highlighting most of the test strategies…but there are still a ton of practice problems you can use to learn and improve. Think of this as the cookie hidden beneath your vegetables. Debbie Stier‘s recently released gem, The Perfect Score Project, cleverly chronicles her experience of taking the SAT a breathtaking seven times in one year, on a quest to motivate her teenage son to success. With everything from horror stories to sweet success stories–and some fantastic study tips mixed in–this book is the perfect counterpart to any of the other, more “serious” prep books. 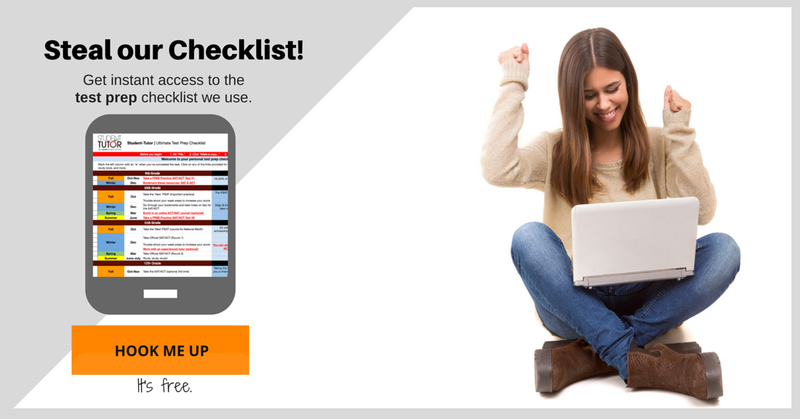 Bring it along for when you need to study…but don’t want to feel like you’re studying. So, you might wonder–why would anyone bother to analyze the top SAT books on the market? Good question! Well, besides being the CEO of Student-Tutor, a test prep and K-12th grade tutoring company, I really understand how important it is to do well on this exam. The SAT test has changed a ton over the past 30 years. A small point increase in your SAT score could (seriously) get you thousands of dollars in merit and private based scholarships. Clearly, this test is pretty vital! And there are tons of resources to help you out. Therefore, take my advice on the top SAT books and get some additional free practice by taking my live SAT e-class I teach online twice week. Did I miss an SAT book that you think deserves to be on the list? Please let me know by commenting below!